Kujawski’s work is directly related to his life in South America. His early memories of carnival masks and costumes and heavily textured city walls bring forth his palette of vivid primary colors. In his words, “In my work I use bright colors and I paint, scrape and slash to expose the layers of paint and to create texture. I create a skin, not just a colored surface.” Kujawski uses these colors to enhance his material of choice, paper. While being one of the most simple of materials, Kujawski’s completed works are anything but simple. He links his choice material back to his childhood surroundings, “In Argentina even crowns fit for a king are made of paper, as well as piñatas, flowers, and saints … paper is the most humble material with noble aspirations.” He manipulates and shapes this humblest of materials into large and small, hanging and sitting, abstract conceptual sculptures. In addition to paper, Kujawksi also works in steel and stone. Kujawski received a BA from Brown University, and an M.A. from Ohio State University. His work has been exhibited at the Beck Center for the Cultural Arts, Art at the Powerhouse and Cleveland State University Art Gallery. 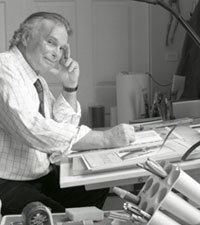 His work is in numerous public collections including the Museum of the Dayton Art Institute, the Leopold Schepp Foundation (New York), and Ohio State University as well as corporate collections including Chase Manhattan Bank (New York), Chrysler Corporation (Detroit), and Sherwin Williams Corporation.